Below are the rules for submitting your entries. For full details regarding the contest and prizes, please read the contest announcement topic. Comments or questions can also be posted there. Any responses in this topic that are not entry submissions will be deleted. HOST YOUR IMAGES AT FLICKR! In the past we've been lenient about usage of other hosting sites and/or the forum image attachment tool. We're going to be doing the voting a little differently this time around and Flickr gives us the versatility to do so easily. Any entry not submitted via Flickr will be disqualified. Submit your images to the TnB Flickr Group Pool (you can add as many as you want there). 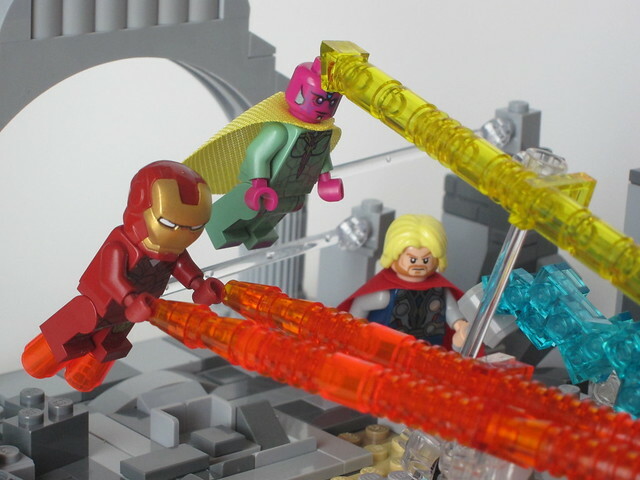 Tag your images as "Toysnbricks LEGO Avengers Contest". You may link your Flickr account in your entry submission response here so we can see additional images. The name(s) of your model(s). 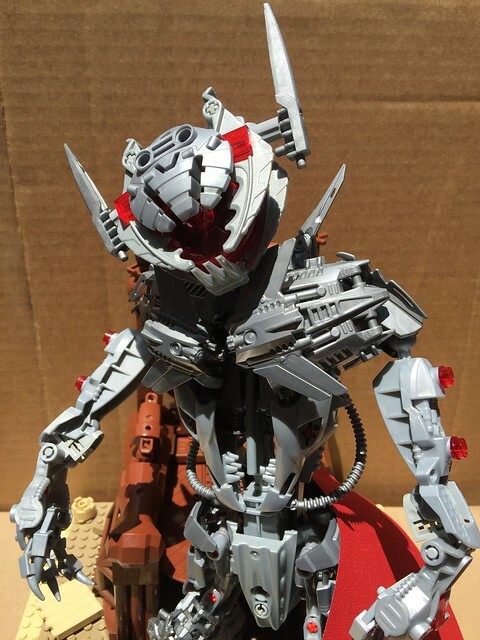 Description of your creation is optional, but recommended. You may edit your entry as many times as you like until the deadline (June 30th, 2015). Voting will commence after the deadline. 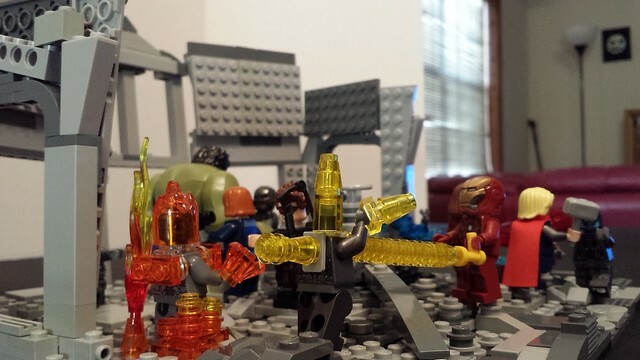 Haven't seen Avengers 2 yet, so I had to choose a scene from the first movie. 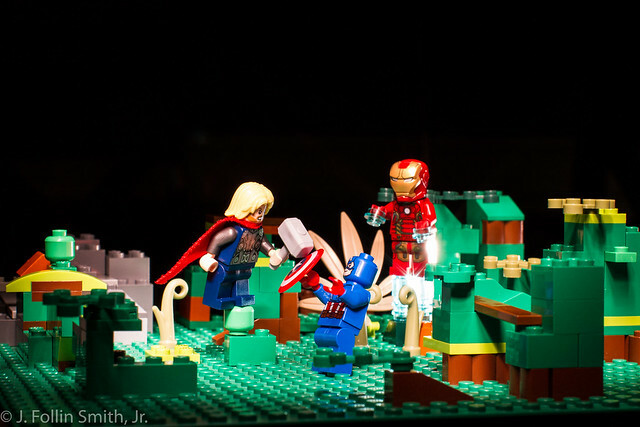 The battle between Thor and Iron Man has to be one of my favorite scenes so I went with that one. My favorite part of The Avengers movie was its sense of humor. And to me the post-credits scene made me laugh the hardest. Being a minifig collector, I had to work with my best assets. My minifigures! So this is the best I could come up with. 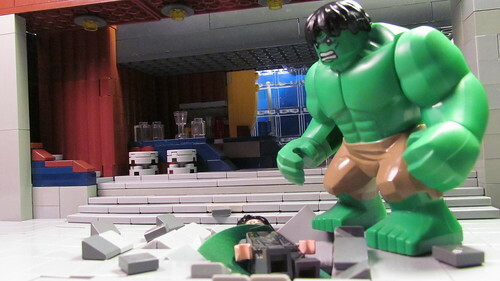 Here is my entry for the Avengers Movie Scene contest. 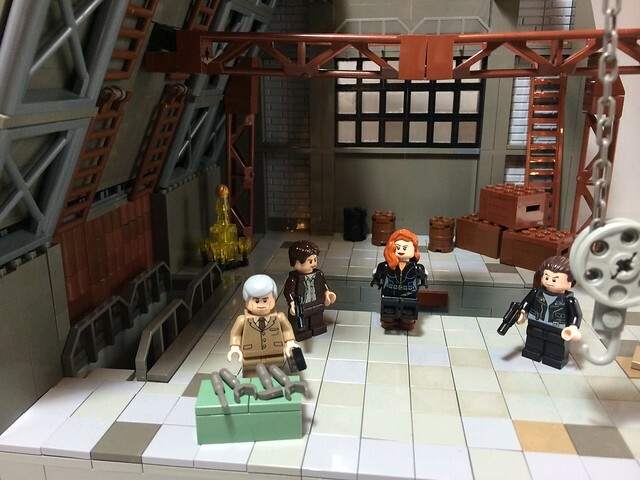 It is the warehouse scene at the beginning of the first movie where Natasha "gets interrogated." 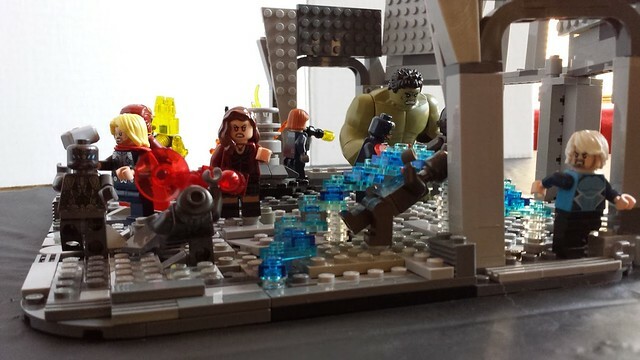 I positioned the mini figures to represent the scene just as the boss is going to answer Coulson's phone call. 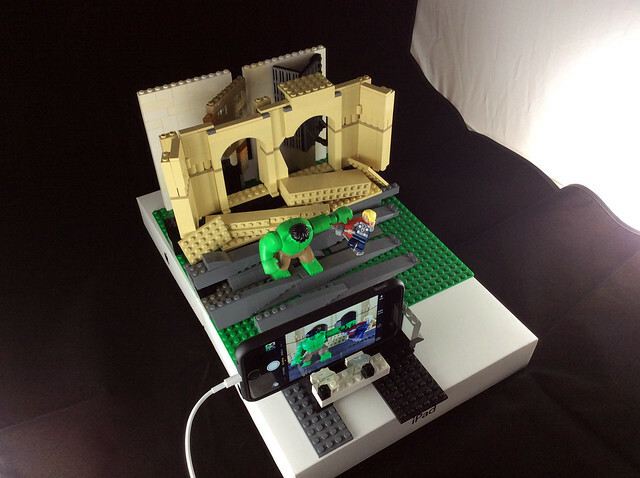 The scene is built on a 32 x 32 baseplate. The full warehouse would be much bigger at this scale, but I did the build off-center on the plate so that I could get the back wall and the stage right wall in. The floor level is built up so that I could represent the stair well and the pit that Natasha's chair is precariously poised over. I intentionally used a mix of new and old grey in the floor to give the place a "dirty" feel. I am confused on my there is an elaborate chandelier on the floor by the stairwell in this warehouse, but I included it for the sake of accuracy. 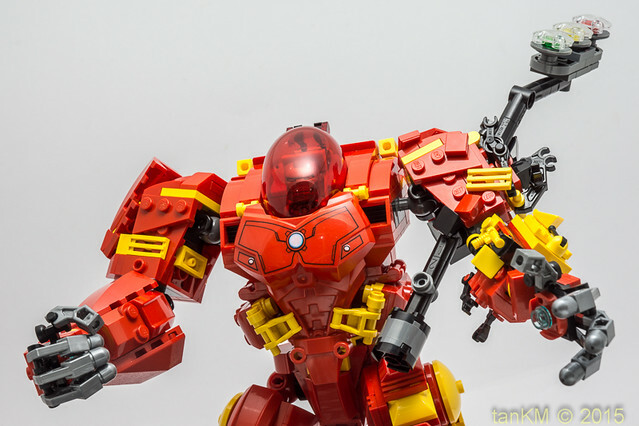 Avengers: Age of Ultron - The BIG GUNS! Here is my submission for the contest! 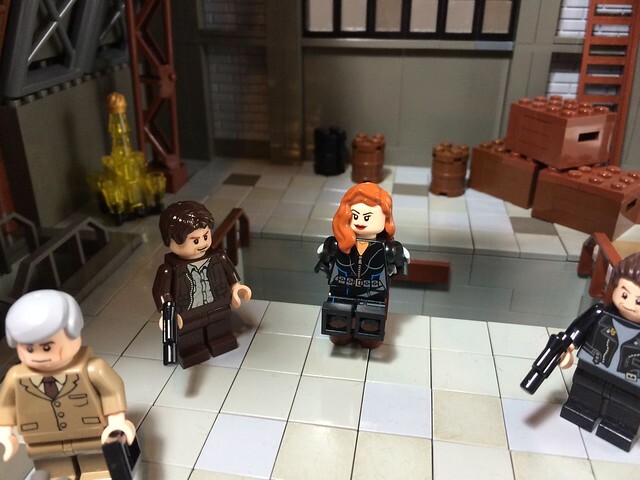 It is definitely one of my favorite scenes in the sequel and I set out to try and recreate that moment in lego. 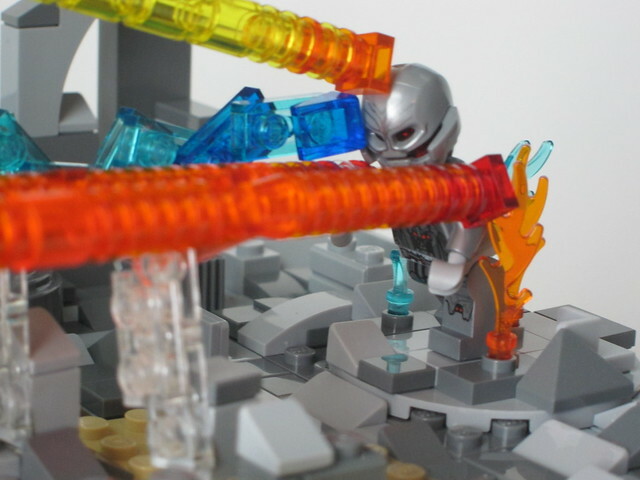 Here is a close-up of Ultron getting blasted! I am unsure of the total count of pieces, I honestly was starting to exhaust some of my supply due to the lack of said pieces XD. I found this contest to be really cool and perfect for my interests, that being Marvel and the cinematic universe. I'm loving the entries so far and can't wait to see more before the end. I seriously check this thread every day to see new entries XD! Hope you guys enjoys my entry. Last edited by LetterCsquared on Thu Jun 11, 2015 6:47 pm, edited 1 time in total. This is my submission on behalf of my son. The other submissions look great! This scene seems to be popular. PS- sorry for the watermark. Just switched to Lightroom and having difficulty. 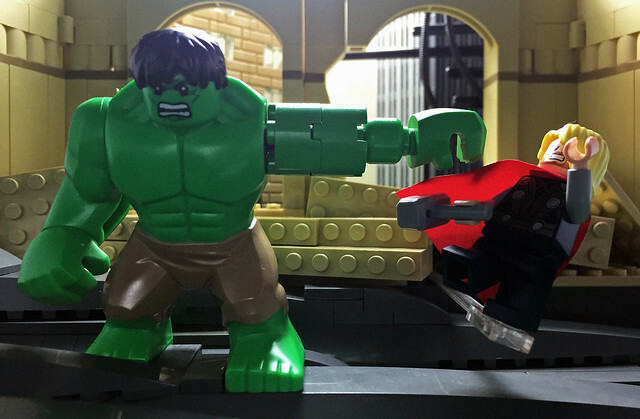 Here's a build of my favorite moment from Avengers, in which Hulk punches Thor for no reason at all after working together to take down a Leviathan. This was definitely a new challenge, as it's the first build I've ever done in which I tried to do more with lighting than just blasting it from all angles. I tried to recreate the light coming through the broken arch windows from the city outside, and am really happy with the result. 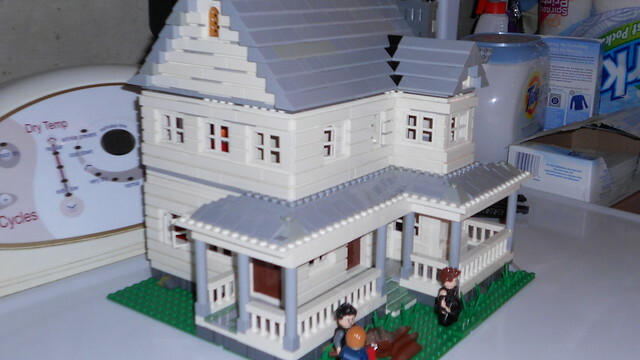 Counting pieces was a real challenge, but it's somewhere around 410 Lego bricks. Thanks for a great contest, TnB! Tony Stark and Bruce Banner work in secret to create a peacekeeping artificial intelligence, but something sinister emerges instead. As the sentient AI pores through archived data, learning about The Avengers and the violence of human history, J.A.R.V.I.S. falls prey as an apocalyptic scheme takes shape. When I first saw this short scene in Avengers: Age of Ultron, I immediately fell in love with the visual design and thought it was a fantastic introduction to Ultron's character. 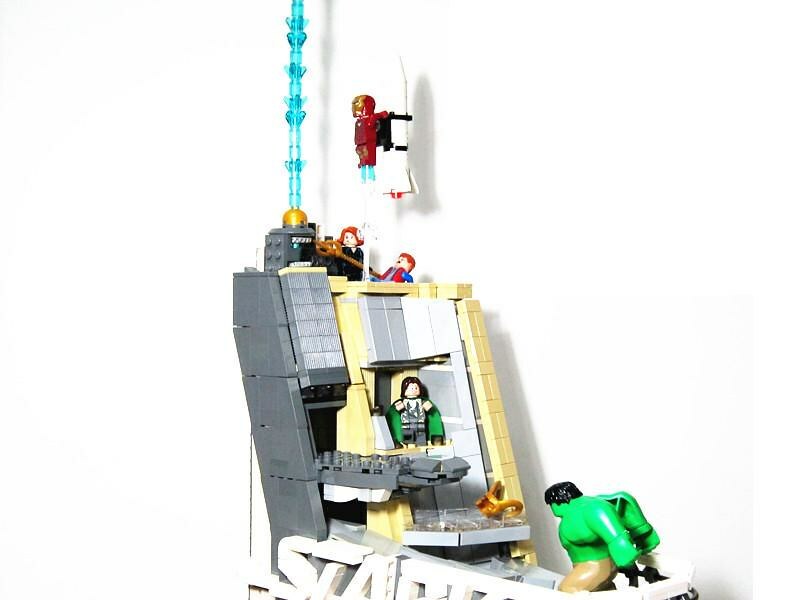 It was an interesting challenge creating something that evoked the abstraction seen in the movie while also keeping the "accessed data" vignettes at minifigure scale, but I think it turned out pretty well. "Is That The Best You Can Do"
The title is a quote from Thor when he asks Ultron is that the best you can do and then the army of Ultron's come from every where to attack the Avengers. 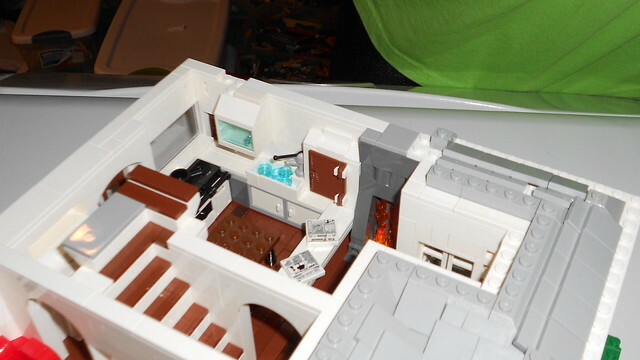 The entire scene contains a lot of action sequences and I was able to incorporate several in this build. 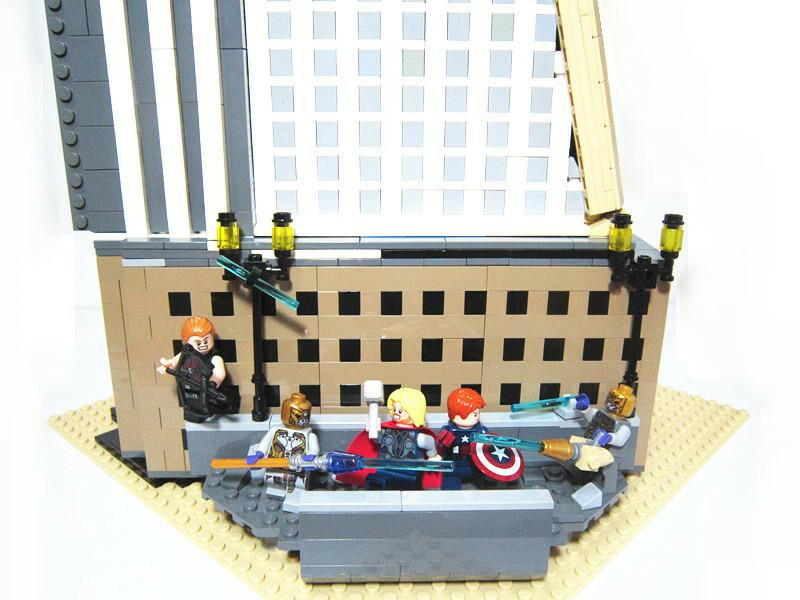 The set includes (clockwise): Hulk, Captain America, Pietro (Quicksilver), Wanda (Scarlet Witch), Thor, Iron Man, Hawkeye, Black Widow, and several Ultron. For more pictures and screen shots of the scene I used check them out on my Flickr. 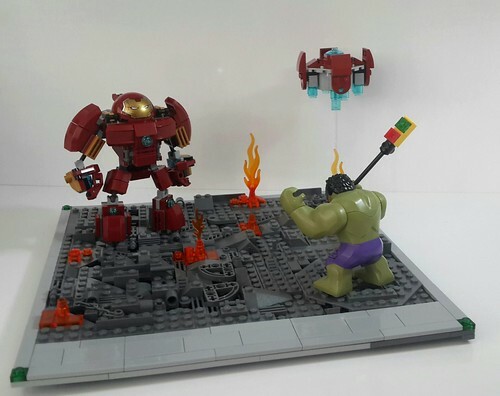 I wanted to build my favorite scene from Avengers 2 and my favourite scene was the fight between Hulk and the Hulkbuster suit.I know it's forbidden to use builds from original sets so i had to build my own custom hulkbuster.To build this scene i used 32x32 baseplate i created. 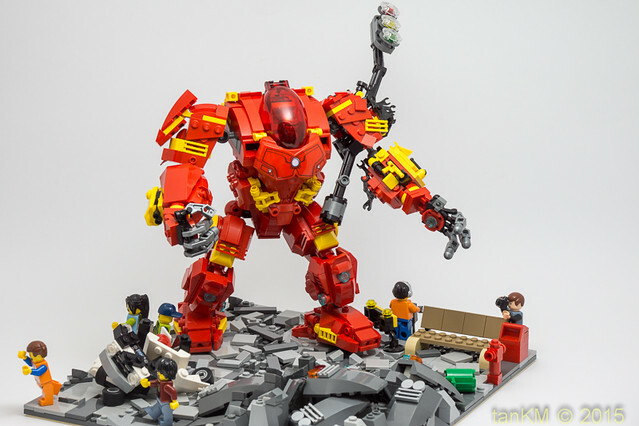 Name of the Model is "Hulk VS Hulkbuster"
Ultron rises from his throne, removes his cloak, and reveals his evil plan! 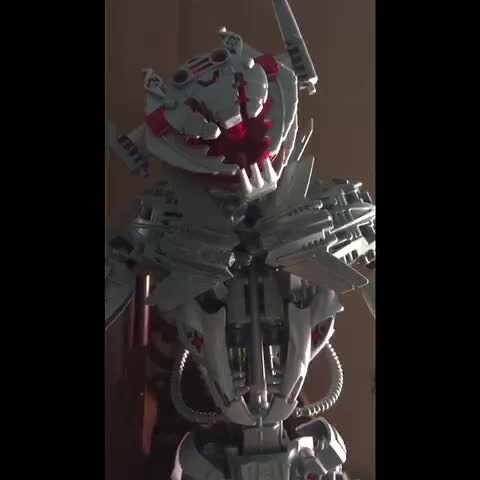 My ultimate Ultron stands over 2' tall, features countless points of articulation for super-posability, and even lights up! Click on the image below to see him light up! 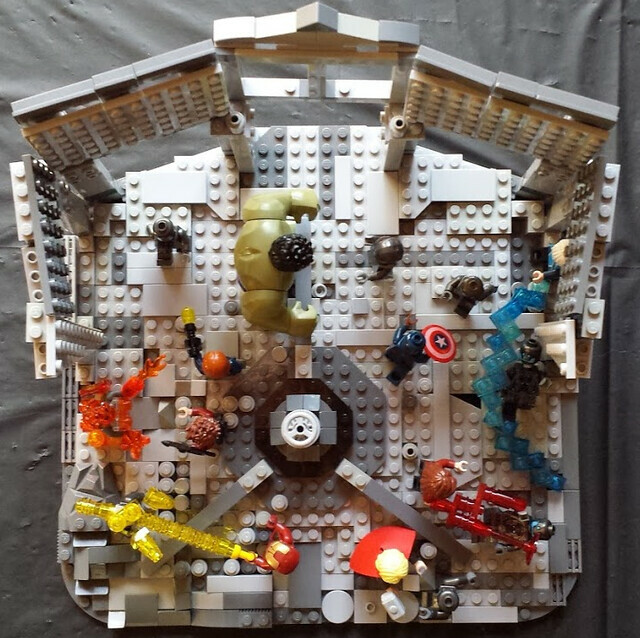 I tried to incorporate as many unusual pieces as possible into Ultron's throne, including two types of castle doors, Rock Raiders roll cages and boulders, wagon wheels, and Ben 10 body pieces. Watch the scene this is based on. Here is the scene I chose. 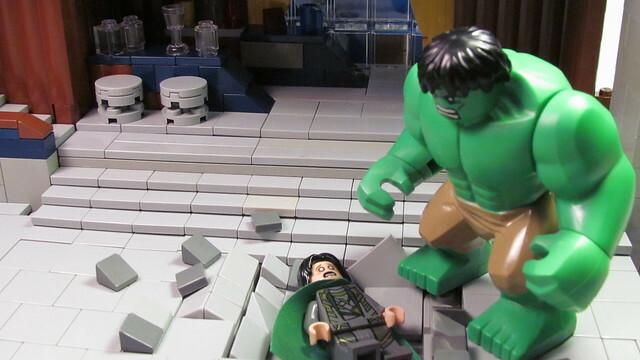 It's when Hulk clobbers the mess out of Loki and leaves him in the ground. I've attached the reference picture below, and below it, is my entry. Thank you, and good luck to everyone! Last edited by Astericked on Fri Jun 26, 2015 7:18 pm, edited 1 time in total. 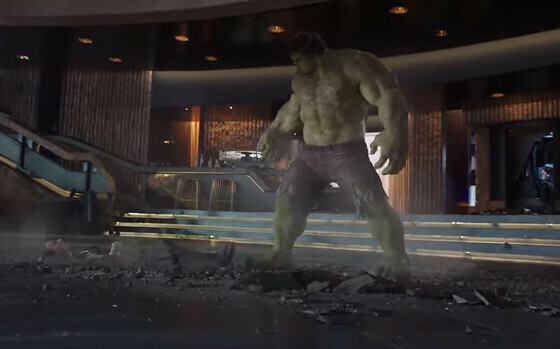 From that moment in the first Avengers movie when the pilot ordered to distract Hulk realizes he's doomed... 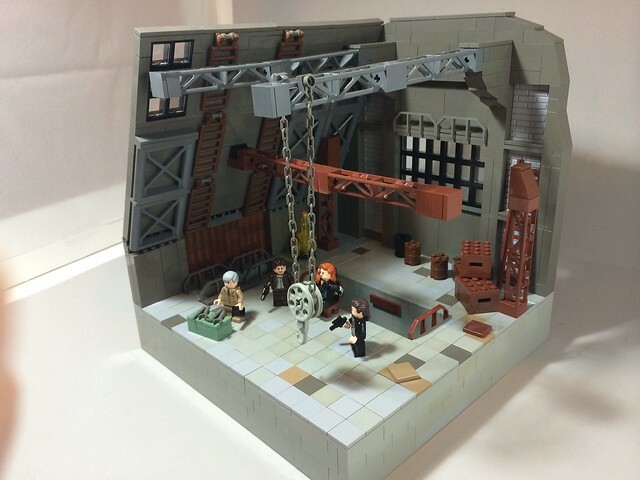 I have no idea how many pieces this is. I went for as much accuracy as possible at this scale on the F-35B, hence the flap on the top, right behind the cockpit, that opens to reveal the propeller used in STOVL mode. 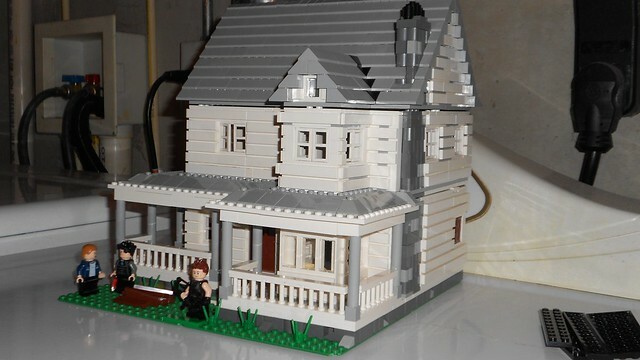 My submission for the Avengers Contest is Hawkeye's Farmhouse from Age of Ultron. The reveal of Hawkeye's family and farm was one of the most surprising parts of the movie and added depth to Hawkeye's character. The farm itself is the setting of many memorable scenes including Tony and Steve's feud while chopping wood and the Avengers' discussion of Ultron with Nick Fury in the kitchen. 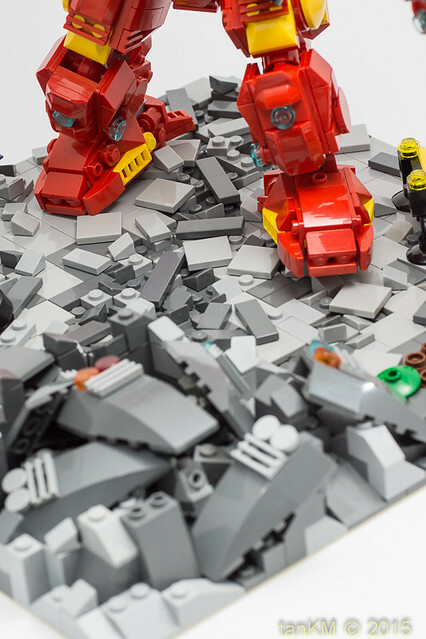 My version is built on a 32x32 baseplate and includes a little over 1000 pieces. "Loki 0, Hulk 1... 2... 3, and 4"
User Astericked beat us to it (no pun intended), but here's our take on the famous Loki beat-up. Model by my 9-year-old, photo and "cinematic" colour correction by me. We used roughly 100 pcs. Good job everyone, we love your renditions and it's a blast to reload the page everyday to see the new entries. And thanks to Toysnbricks for holding these fun contests. 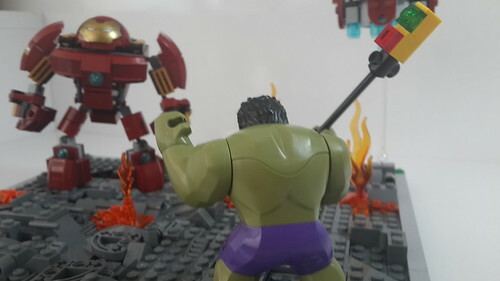 Description: Scene from Avengers Age of Ultron where Hulkbuster left arm's been badly damaged with the Traffic Light post. This is the scene where the damaged arm is about to be ejected and replaced with a new piece. Thanks Toys N Bricks for holding this contest. Great to see so many MOCs. Last edited by tankm on Tue Jun 30, 2015 7:01 am, edited 1 time in total. I have promised myself not to have a last-minute entry, but this contest just came in when I am about to have my final exam, so I only started working on the entry last week. I chose the scene "Battle of New York" for several reasons. 1. I haven't bought my Age of Ultron sets. 2. 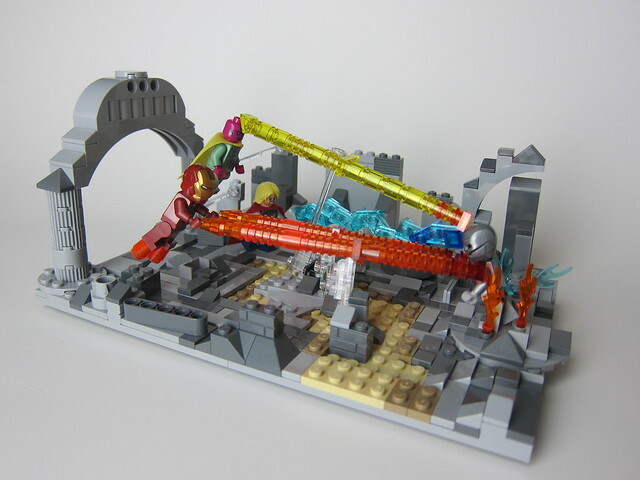 I really want to build something to impress everyone, and I guess the final battle is the most impressive scene from the first movie. 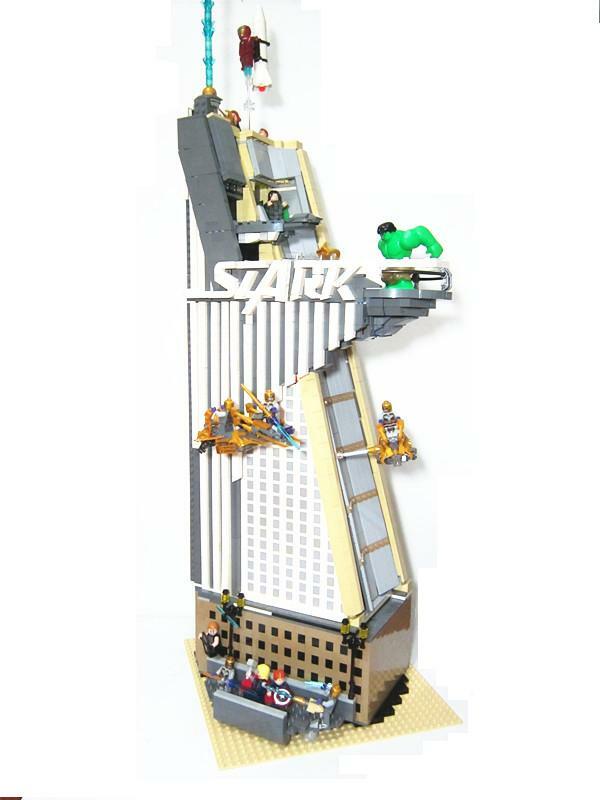 With no more introduction, let's go into the model itself - Stark Tower! "That big ugly...building in New York?" 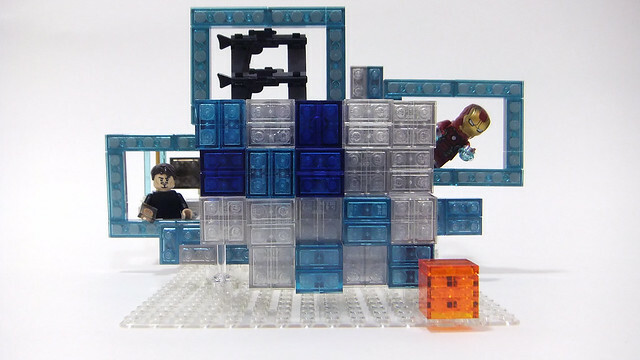 Finally, I have to thank Toys N Bricks again for holding such awesome contest, like LetterCsquared said, I couldn't help checking for new entry everyday as I'm a huge fan of the Avengers movie! 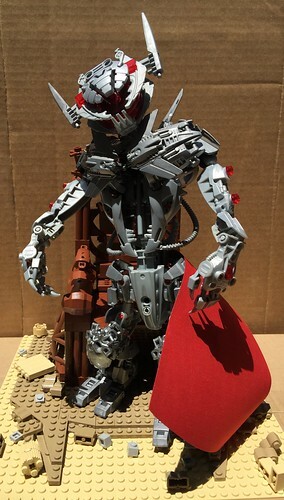 Good luck for all other builders entering this contest and hope you enjoy my entry as much as I have when I build it! P.S. Almost forgot the number of piece count! I dunno, perhaps over 3000? Cus I took down an entire Palace Cinema and a few Castles to finish it.